Today was good. I had an FO (finished object for those not up on their knitting lingo), a Bind Off, and a sugar rush. First up – the FO because it just doesn’t happen often enough. Last Saturday Cathy and I drove to OKC for a SWAK class on Fair Isle knitting. For longer than I care to admit I’ve had the Equinox Yoke Pullover in a holding pattern because I was just too chicken to tackle the colorwork without a bit more experience. Cathy, being an accomplished knitter, knows how to fair isle but is usually game for a road trip to SWAK. 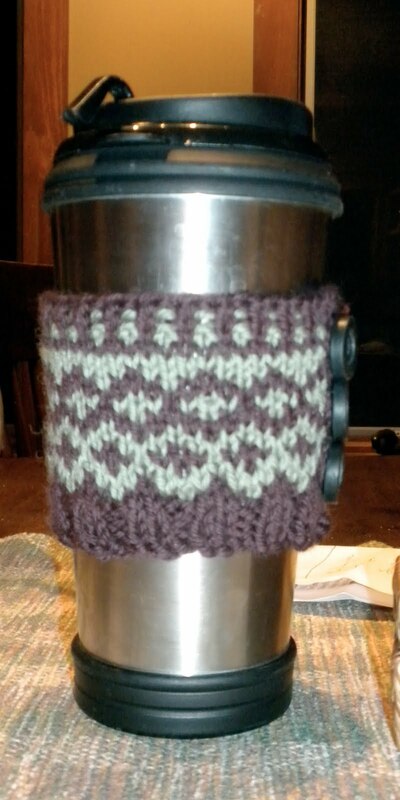 Here my dear readers is my Mug Cozy in two color knitting. (Pattern on the SWAK website) Complete with little black rubber buttons sewn on. Chris said it was gratuitous knitting but really liked the stitch pattern. I’m pleased with it since my travel mug doesn’t have one of those rubber grips to keep me from burning the bejebus out of my hand at 4am when we’re on our way to the farmers market. And here’s my Bind Off. I’d call it a Near FO because it’s knitted but currently in the washer with a load of jeans and towels felting itself silly (my hope anyway). The yarn was a vacation purchase from several years ago – maybe three. Manos del Uruguay in a colorway I can’t remember. You can plainly see where I added the second skein but since it’s being felted I don’t think the change will be obvious when I pull it from the dryer. It doesn’t look like much now but it is a journal tote for me to use while hiking. Hopefully I can find decent webbed strapping with one of those metal adjustable contraptions for the shoulder strap. The best part of the day was not an accomplished by me. Chris, as has been stated before, has been craving Magnolia Bakery cupcakes. 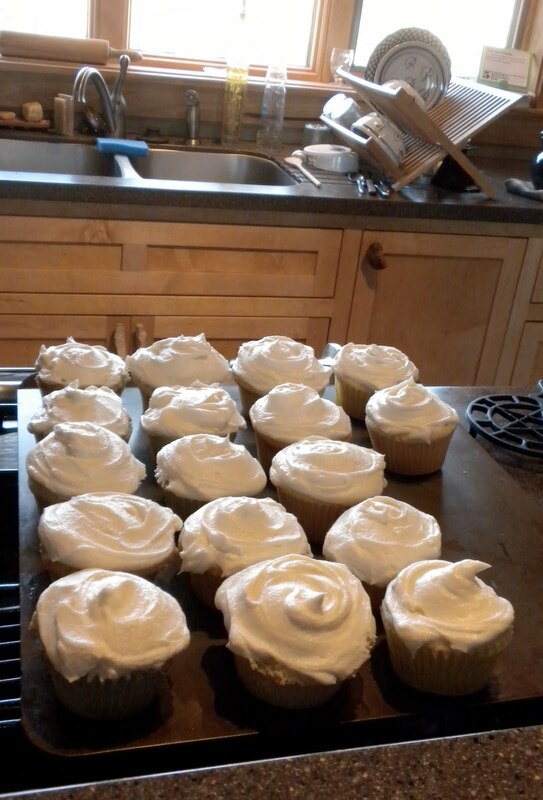 Last night he baked the cupcakes, this afternoon he iced them. They are good!! As good as we’ll get without going back to Bleeker Street. He did half of the icing straight vanilla, half with our culinary lavender! PreviousPrevious post:SteamingNextNext post:Lovin' the tote!